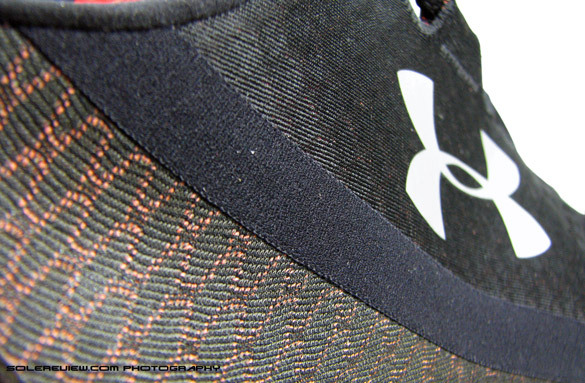 Under Armour's 2014 technical running debut features a seamless heel cup and breezy upper on a lightweight sole package. Both of which results in an high level of fit and ride quality. Performs well for fast runners, though the shoe is found wanting in arch support and upper design best practices. Nevertheless, an impressive push-off for Under Armour's new focus category. It is no secret that Under Armour is an apparel company and while they sell footwear, the latter still remains a small part of their business – 13% in 2013 to be precise. UA has been making shoes since 2006, and they’ve had moderate success with their training line up and more recently, with their Basketball shoes on the Anatomix platform. UA had running shoes too, but most of them looked like running/training hybrids, and unlikely contenders for a fight with mainstream running biggies like Asics and Nike. However, that changed in July 2013 with launch of the $120 Speedform RC, a shoe near identical to this spring’s Speedform Apollo. That shoe was not talked about much, save for a few press releases and reviews on blogs. It was not even a blimp on UA’s marketing 2013 marketing calendar. 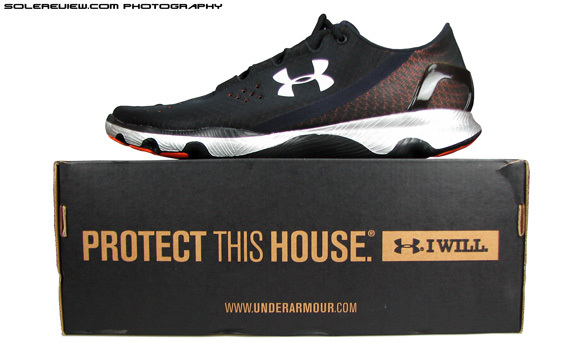 The Speedform Apollo would have also gone unnoticed, had it not been for Under Armour’s major marketing push in Q1. UA was very aggressive with the Apollo launch, right from featuring Speedform at the pop up ‘House of innovation’ at the Grand Central station (NYC), to creating Speedform Zones in different retail locations. All of that was topped off with a 60 sec commercial (2 mins extended) created by Hollywood director Peter Berg (Lone Survivor, Battleship, Hancock). The commercial was shot at the March Air Museum in California, with the theme, ‘This is what fast feels like’. At the end of the video, the shoe transforms into a F22 Raptor fighter jet, complete with laces and perforation. Peter Berg’s choice as the director would have come naturally, given his multiple associations with Under Armour in the past. Examples worth mentioning would be the ‘Footsteps’ commercial or the UA-Hasbro apparel line for the ‘Wounded Warrior’ project, taking inspiration from Peter Berg’s ‘Battleship’ movie. 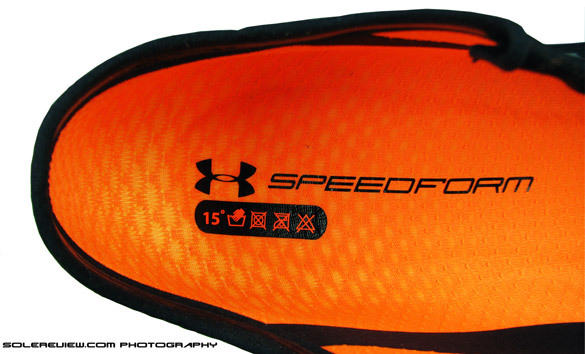 While the Speedform RC still sells on Under Armour’s site, it is clear that the spotlight is on Speedform Apollo – which also goes by the plain sounding ‘Speedform RN’ name. The web banners aggressively promote the imagery of F22 Raptor in likeness of the Speedform Apollo. 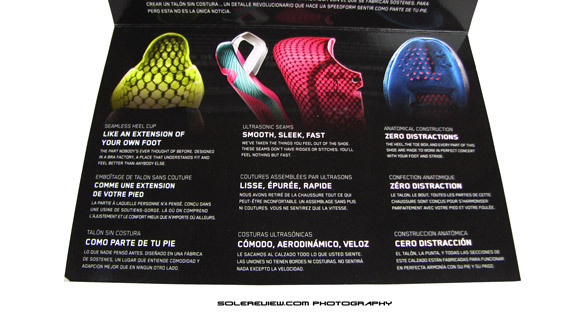 Key call-outs by Under Armour point towards the shoe featuring a ‘seamless molded heel cup’ and the ‘first running shoe to be made in an apparel/Bra factory’, highlighting the promise of a superior fit and feel. So with all the hoopla around it, just how good is this shoe? We put the Speedform Apollo through its paces the past week and we’d like to tell you that the shoe delivers on most of its promises. There are still a few kinks which need to be smoothened out, but UA’s technical running debut for 2014 is impressive and hopefully it is a harbinger of things to come. Starting off with the seamless heel cup – it is indeed a brand new innovation in footwear construction with practical, real world benefits. While we’ve seen executions of sockliners attached to the heel area with turnover seams (Vibram Five Fingers, Nike Aquasock), a one-piece heel interior is a new trick. Going against convention, the entire rear foot lining (extending to the mid foot) is one fabric, with zero seams. The lining fabric changes on from the mid foot area – and the material between front and rear are sealed with a tape, the texture of which blends in with the material it covers. The entire heel area is super minimal; the collar area lacks any padding and instead, the top of collar is lined with a silicon tape meant to grip the ankle. It is supported on the outside by a molded, plastic heel clip which gives the heel its shape. The construction is indeed unique, and it translates into superior heel lockdown during motion. 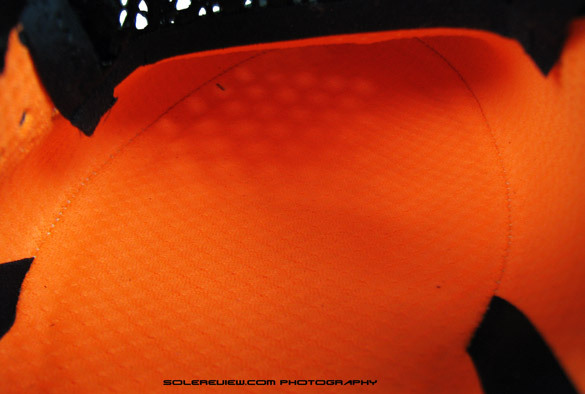 The ball of the foot fits snugly during runs, and the silicone binded collar edges keep the foot from moving out. The heel fabric has a slight stretch to it, and that plays a role in keeping the heel from slipping out. However, we must point out that the collar tip (Achilles area) is higher than it should be, and rubs against your Achilles. This material is soft, and while it will not cause blisters, some runners might get the sensation of the upper poking against the skin. That said, the overall heel package fits and feels great; it is just a stellar example of how minimal construction can feel, fit and look great at the same time, and clearly Under Armour has a winner with the new heel construction. Based on the commercial success of this shoe, it would bode well for the brand to extend this into different tiering levels within the running category. The upper of the Speedform Apollo has a two fabric construction – front area of the fabric is thicker than the rear, and that seemed necessary for the shoe to retain its form, and also allow enough thickness for all the perforations to happen. 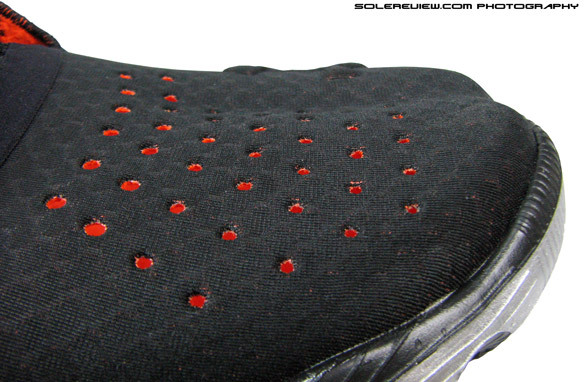 Talking of ventilation, it is amazing how many holes are punched in the upper. The toe box, the outer and inner sides, all of them have more than generous amount of perforations in them, and as if that was not enough, the tongue is made of a flat spacer mesh which lets air through in abundance. We tested the shoe in 25° C/77° F with a relative humidity of 75%, and the shoe excelled in ventilation. This is an ideal shoe if you’re looking to run during summer. Very airy, and keeps heat from building up inside. The forefoot area has plenty of room, both on the sides and top. The forefoot area allows for enough room to result in a comfortable toe splay, and upfront the toe box height gives the toes enough wiggle space. 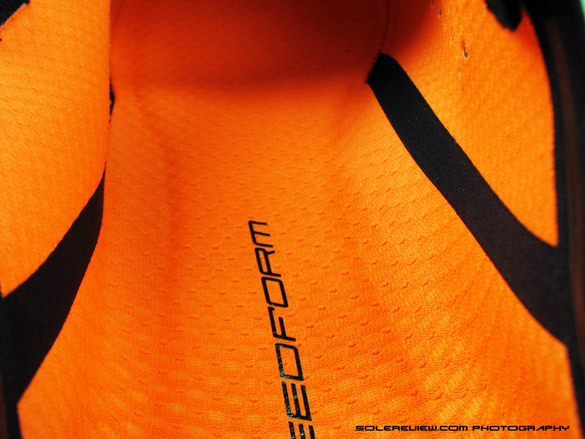 The Speedform Apollo has a molded ridge (see image) above the big toe; while this somewhat mimics (only cosmetically) the Vibram five fingers, the Speedform’s ridges serve nothing more than an aesthetic touch, and at the same time contributing to the toe box height. Last year’s Speedform RC had contours for all the five toes, while in the Apollo, this detail has been toned down and just ‘splits’ the toe box into two areas. The tongue and lacing system shines in a few ways, and we’d like to spend a few minutes on that. 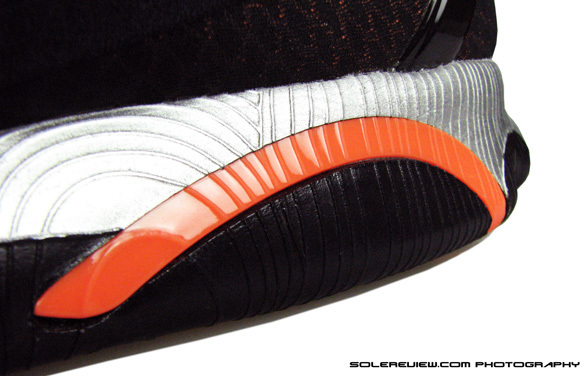 The tongue has a asymmetrical construction (see picture), the tip of the curve being higher on the inner side of the shoe. This helps solve an age old problem which confounds most runners – there is no tongue slide during runs. The Speedform Apollo’s tongue is not attached to the sides of the shoe, and is only helped by a tongue loop, and under normal circumstances the tongue would have slid on its side after a mile of running. But the unusual shape of the Speedform Apollo’s tongue puts a stop to any of that happening and the tongue stays centered all through. We think this to be a very useful feature; we bemoaned tongue slide in our review of the Nike Flyknit Lunar. 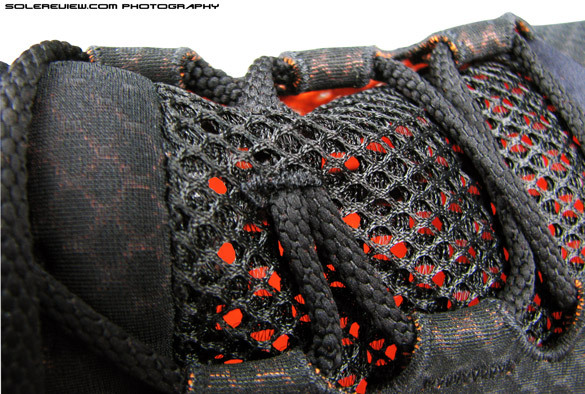 The other thing worth mentioning are the loops through which the laces pass through. Except for the top round eyelets, the rest are anti-slip loops, the kind we don’t see often. This means that when you pull on the laces with the intention to fasten them, they do not slip backwards through the loops. Nice touch of detail, and a very practical one at that. But the laces were too long for the size US 11 we wear-tested, and they could have been 20-30 mm shorter overall. In our case, the tied lace loops and the aglets tips kept on smacking the sides of the Apollo while running. We are not sure of this issue in other sizes, but for US 11, this is an area which needs correction. There is another problem with the Speedform upper design, and this is serious in our view. 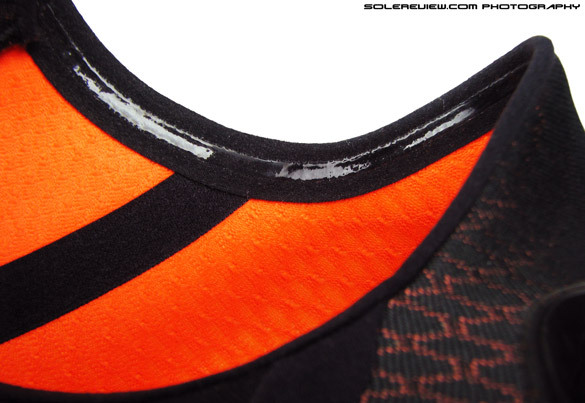 If you look at the picture showing the lace loops (above), you’d notice that the last loop is folded over, and has a circular eyelet smack in the center of it. The placement of the last loop is flawed, because the hard corner tends to dig into the foot, and not only is the feeling noticeable, it is uncomfortable too. 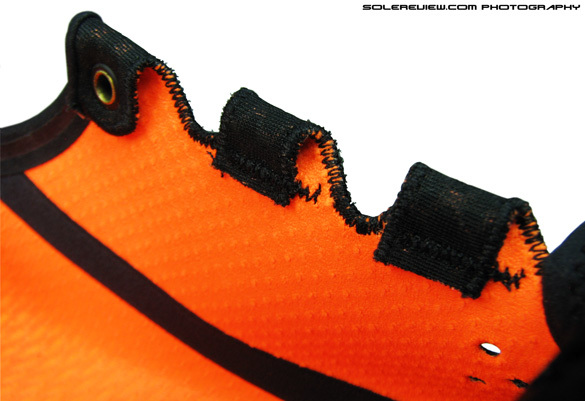 Our first run in the Speedform Apollo ended with a temporary redness where the faulty lace loop dug into the skin. Being new in the footwear game, Under Armour still has a fair distance to cover when it comes to adopting design best practices in running shoes. The interior of the Speedform Apollo is near seamless, which also means the sockliner is integrated with the upper and cannot be removed. It is part of the seamless rear foot construction, and an invisible reverse seam binds the insole from midfoot to toe area. There is a foam lining just below the insole fabric (UA specs says 5mm Ortholite), and you can run your fingers over it to feel the slightly elevated contour. This greatly enhances the fit and feel of the shoe, but this construction is not without its functional drawbacks. One, you cannot insert custom orthotics, and two, you cannot wash the insole separately. You’d need to dunk the whole shoe in a bucket, and for that purpose Under Armour has conveniently printed washing instructions on the sockliner. 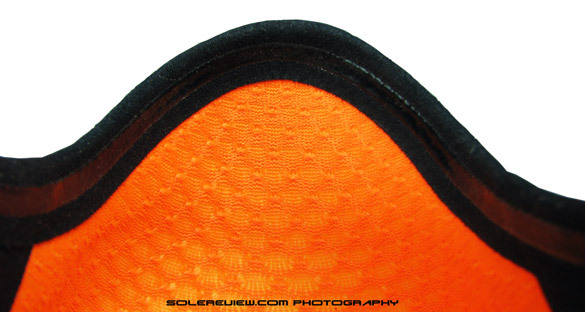 The fused sock-liner inside the shoe is flat, and arch support is conspicuous by its absence . Since the Apollo lacks a molded sockliner or an outsole flare, the arch of the foot leans on the upper. 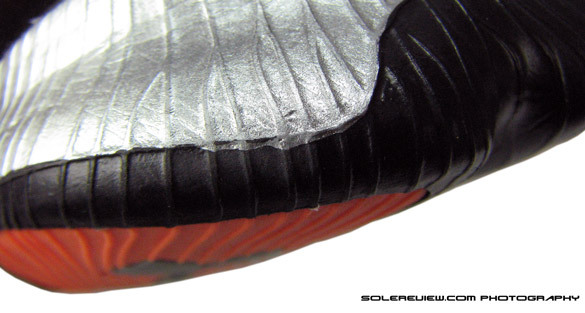 What’s worse, one feels the midsole edge under the arch during midstance. This makes the use of the Speedform Apollo unsuitable for flat footed runners – excessive foot eversion will be uncomfortable in the Speedform Apollo. 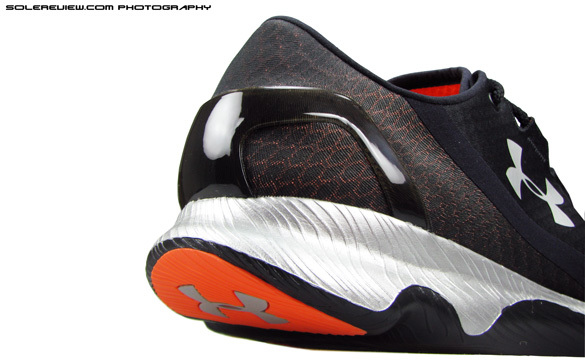 The upper sits on a single piece, 8mm offset, injection molded EVA (Ethyl Vinyl Acetate) midsole which UA calls MicroG cushioning. The sides of the midsole are painted silver, with sharp paint lines making the midsole look as if made of two separate components. Silver paint adds dimension to the aesthetics, but longevity of the paint job needs to be seen as repeated stress (and nicks) on the midsole might lead to cracked paint. The ride of the Speedform Apollo is firm without heel sinks, and conducive to tempo runs. It is stable too – the forefoot and heel area flares outwards, and apart from making this a shoe suited for forefoot strikers, this also keeps the heel and forefoot centred during the gait cycle. Heel to toe transition is surprisingly good for a single piece EVA midsole. Deep ridges run beneath the arch area, and that helps keep the transition smooth. There is a plastic mini-shank inserted on the arch side, but we doubt its practical usage, especially as a retro-fit on the near identical midsole construction of the Speedform RC sole. Flexibility is adequate, if not great. There is a single flex groove in the forefoot which helps things on the flexibility aspect, and a beveled heel with a flex groove also aids in smoother heel strikes. On the downside, we felt a ‘lump’ under the left arch area , and on closer inspection it appears to be an anomaly associated with the injection molding process, where the expansion/contraction of the EVA during manufacturing falls slightly out of line. But this is noticeable only at walking speeds, and once the pace picks up, the sensation disappears. 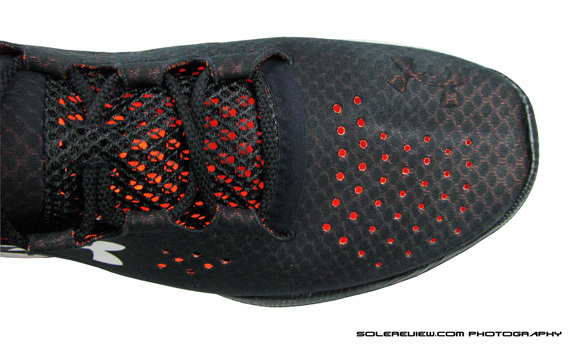 The Speedform Apollo’s outsole geometry is very similar to last year’s RC. The rubber outsole pieces are embedded into the midsole cavities in high wear areas, with the ‘fingerprint’ texture running all across the outsole surface. 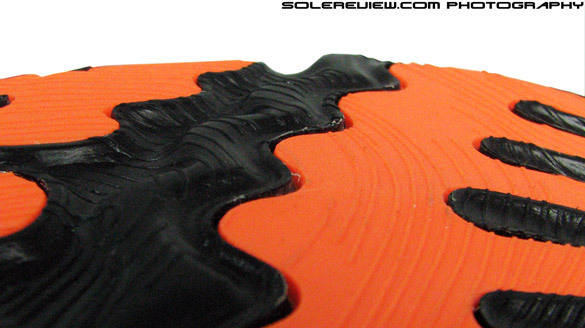 While the rubber outsole pieces sit flush with the midsole surface, the finish of the fitting is surprisingly poor. There were big gaps between the walls of the midsole cavity and rubber inlays, and same goes for fitting of the plastic shank under the arch. While we understand that injection molded EVA is a tough material to work with, there are many examples of other brands doing it right with rubber embeds, so UA should strive to achieve those tolerance standards. The outsole offers adequate grip on tartan tracks and asphalt, though there is a potential red flag when comes to long term usage. 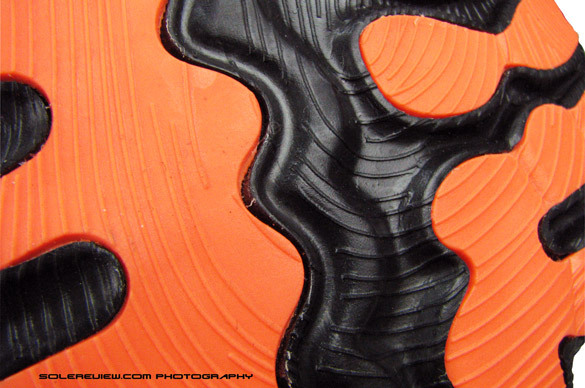 The ‘UA light speed grip’ compound, a translucent and sticky urethane used in the Speedform RC (and in the Charge RC) has been replaced with regular carbon rubber pieces in the Apollo so once the ‘fingerprint’ tread wears off, we suspect the smooth rubber outsole pieces will be slip prone on smoother surfaces. We will keep this area on our radar during our long term testing and post an update once the outsole has undergone a certain amount of wear. 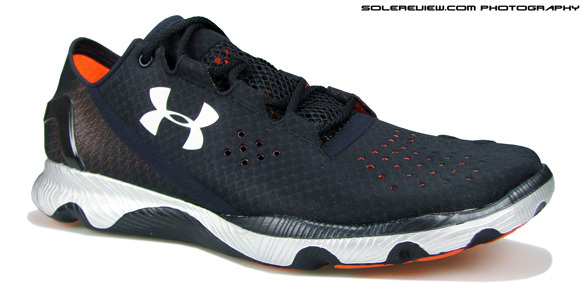 With a construction which utilizes minimal upper overlays, ultrasonic seam welding, a lot of perforations, integrated insole and use of rubber inlays on a injection molded EVA misole, Under Armour has managed to keep the Speedform Apollo extremely lightweight. Our US 11 size came in at 207 gms for a half pair, though stated weight on UA’s product page is 187 grams (we assume for a US 9). That is very light by any standard, and lack of weight contributes immensely to Apollo’s ride quality. It is also decent value for money at $100, given that any running shoe with anything new to talk about is priced south of $100. It is heartening to see Under Armour trying to make its own in the crowded performance running market, and Speedform Apollo can potentially be a great lever in the brand’s goal of capturing marketshare. Its puts together a very useful lot of features, both new and tested, and the result is a foam and mesh freshness in a lightweight package. 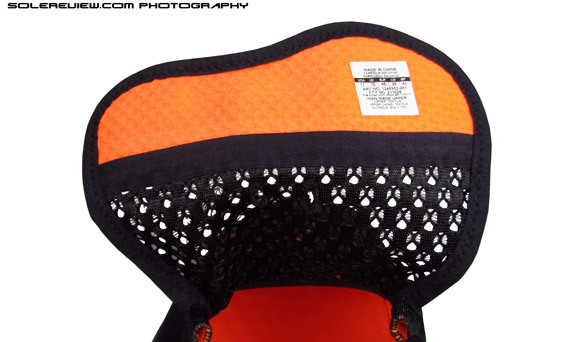 The new heel cup innovation delivers on what it promises, the seamless interior feels great and overall the shoe pleases in more areas than one. Under Armour has built a great new foundation with the Speedform – now the challenge is to make sure that yearly updates are worth waiting for. And not to speak of the opportunity to extend Speedform to other categories like Basketball. Good luck, Under Armour. Hope there’s plenty more where the Speedform came from.